Love of fragrance is a happy common denominator. Mention your favorite perfume out loud, and people will gather around, eyes alight, eager to join the conversation. Each scent they name touches upon an unforgettable event in their lives that has made them who they are-- unique and irreplaceable. At the end of such exchanges, I always feel a sense of good fortune and gratitude. For me, it brings home the truth that when we talk about scent, we're really talking about our souls. All of our lives and memories are like a fragrant bouquet which we can gather together and present to the world. Here are several wonderful essays written by fragrant friends dear to my heart. I hope you enjoy reading them as much as I did. The earliest memory I have regarding a fragrance applied to my skin is Coppertone sunscreen lotion, in the brown plastic bottle, when I was a toddler. Beach scents in general are very comforting and pleasant to me. Other scents that I am attracted to are coffee grinds, lavender, rosemary, cucumber, honeysuckle, watermelon and citrus, particularly grapefruit and lemon. Also, I find sheets dried outdoors on the clothes line to be intoxicating. Among my oldest scent related memories are towels and linens in my grandmother’s laundry. They were white and warm and smelled like Ivory Snow. Not many things smell as wonderful as blankets and other linens when they come out of the cedar chest. When thinking of my grandmother in terms of fragrance there are a few that come to mind. She kept little blue puffs of whipped soap in an apothecary jar in her bathroom. I can’t describe the scent well but it was subtle and wispy and I still have a vivid memory of it. Her big white claw foot tub when filled with steaming hot water frequently smelled of Jean Naté. She kept a bottle of Chanel No. 5 on her dresser but I don’t remember her ever wearing it. I do remember that she liked the smell of Tea Rose and that she always had a bottle of Sea Breeze that she used for a variety of things. Although, sadly, like many other products, the current Sea Breeze formula is a pale reproduction of the one I love from years ago. The flowers in my Grandmother’s garden are also a very powerful scent related memory. White peonies and peach colored roses were among her favorites and now mine. My Grandmother also kept balsam fir sachets around the house and the smell could envelop you. My Mother used bath oils, usually Jean Naté, and Avon bubble bath. There were a couple of others that I can’t remember just now but I am certain that if I smell them again it would take me back immediately to the calm of our blue tub in the blue bathroom in the house that I grew up in. I always loved the smell of her Prell shampoo. Shampoos that I used in the 70‘s were Vidal Sassoon and Pantene, the green one. They both smelled incredible. The almond scent of Vidal Sassoon was intense, something like marzipan. I loved it then and still do. Marzipan is a favorite food smell of mine along with almond extract and pure vanilla extract. Both of my parents were big tea drinkers and subsequently, so am I. Tea leaves are a fragrance that I can count on to revive and reassure me. The smell of Coppertone also reminds me of my Mother. Although my Mom didn’t wear perfume per say, she used to keep sachets in her drawers and closets. They were frequently different scents and her clothing smelled fresh and soft. My Mother had a beautiful flower and vegetable garden. Her red American Beauty roses were very fragrant. I almost never smell roses now that smell that wonderful. We used the spearmint, that she grew, in iced tea in the summer. I love the feel and smell of fresh spearmint leaves. Growing up I had a lilac tree in the yard, that I planted myself, and I still love the smell of lilacs very much and look forward to the week or two in the spring that they are in bloom. It is a short window of extravagance. I have adapted my mother’s habit of putting sachets in her drawers by putting bars of soap in with my clothing and linens. A favorite of mine for this purpose is Cape Shore Cranberry. It is a great bargain for a very rich scent that lasts forever. I also use lavender and lemon-verbena. I have had the same bar of Maja olive oil soap by Myrurgia of Spain for about thirty years. I keep it in a box in a drawer with other toiletries and just smell it occasionally for a bit of exotic indulgence. I love soaps and bath products as much as a great fragrance. My feelings about Caswell-Massey and Crabtree & Evelyn are enough for another essay entirely. When I enter into an apothecary it feels as though I am transported back in time. A bathroom with a great tub and glass shelves with beautiful bottles sounds like heaven to me. I also want to cover men’s fragrance briefly. That subject too is enough for a separate endeavor. I love, partly for sentimental reasons, Irish Spring and Old Spice. There are some wonderful smelling men’s colognes but in any instance no scent at all on a man is better than the wrong scent. The first fragrance that I actually wore as a young girl was Love’s Lemon scent in a spray bottle. My cousin Monica gave me two fragrances as gifts when I was a teenager that I still love today and I would say that they are my signature scents. When I was about thirteen she gave me Love’s Rain scent in a concentrated vile with a sponge dabber top. The glass was clear and the fragrance was a light bluish green. It was beautiful and unique and became a part of who I am. When I was nineteen she gave me Chanel No. 19. Over the years I have experimented with most of the Chanel scents but always return to No. 19. Once, I hadn’t seen someone in many years and when we hugged hello they said “you still smell good, you smell like you”. I was wearing Chanel No. 19. I read once that Coco Chanel’s favorite fragrance was actually No. 19 and not No. 5 as most would assume. For many years I also wore Clinique fragrances. I started with Aromatics Elixir which I used for at least ten to twelve years and for another eight to ten years I wore Happy. I found recently that it tends to degrade after time so I stopped wearing it but I still like the original scent. Many people still identify me with those. Years ago I discovered Jean Louis Scherrer. I loved it then and think I am going to get back into it. The bottle is classic and traditionally French as well. Very dependable. I have a couple of atomizers and would like to collect more. The bottles that perfumes and other fragrances come in are an integral part of the experience of wearing any scent. Dabbing or spraying. Oil or alcohol. Clear or colored glass. There are nuances involved in the overall experience that are intimate and deeply personal. I gave up wearing Love’s Rain scent when I was about twenty when I discovered Rain by The Body Shop. Not The Body Shop that is known world wide but a smaller California based company, which had to change their name, because of The Body Shop we all know, to Terra Nova. I love that scent and have worn it for nearly thirty years. Lately I have had trouble finding it and when I did the new formula seemed diluted. The new bottle was ordinary when the previous one was just beautiful. I will continue to wear it and still like it but it is not as good as it’s predecessor. There are a couple of body mists that I like. One is the Lavender mist by The Healing Garden. It is also increasingly difficult to find and a bit diluted compared to its original version. Bath and Body Works made a fragrance that I absolutely adored called Aquatanica Spa. It is sadly discontinued and I can’t even find it on line. It is similar to a scent that I wore briefly called Island by Earth Elements, which I also liked very much but cannot find a replacement easily. I love using various fragrant shower gels Lavender Vanilla by Bath and Body Works, Early to Rise by Kiss My Face, Oatmeal & Almond by Yardley of London but my most favorite that I have used for about twenty years is Neutrogena Rainbath. It looks, feels and smells luxurious. I also have very particular tastes when it comes to candles and room sprays. Aromatherapy of Rome and Agraria are the best smelling that I have ever found. Agraria Balsam room spray is just perfect. Aromatique products are also very good. I would like to mention that I do not care for Yankee Candle or Glade products. They are not the least bit authentic and just don’t smell good. A recurring theme seems to be that fragrances that I am interested in and care about are fading away in more ways than one. I think that right now I am at a fragrance crossroads. Seeing that I just reached the half century mark it is appropriate. I am looking for a new scent that makes me feel like me. The right scent can give me peace of mind along with rejuvenation and some degree of joy. For me, the visual or aural equivalent of smelling a favorite scent is like looking at the moon and stars over the ocean or hearing church bells and wind chimes. They all touch my soul. Be it eau de parfum, cologne spray, body mist or something else all together, fragrance, the sense of smell, can connect you to your past and to a place inside yourself in a powerful and meaningful way, more so than any of the other senses. The experience of scent can provide a transformation of place and time and frame of mind. The dog days are not the time to bother with subtlety in perfume. Eeh, what’s the point? Heat and humidity either cook the fancy florals right off you, or else make them hang about awkwardly in the air like so many pre-teens at a dance. In short, nuances in scent need higher barometric pressure and lower temperatures to succeed. And another thing. If you are going down to the boardwalk for an evening of Mr. Softees and fried dough, I’m guessing that Bois des Isles just isn't happening. Sticky and aloof just don’t hang together. You need a democratically inclusive kind of a smell, one that everybody sort of likes but doesn’t find hard to understand or anything. Lately, I hit upon two that were just the thing for an evening in Asbury Park, or even Atlantic City: Fraaagola Saalaaata (Hilde Soliani) or else BriarRose (Ineke Ruhland, Floral Curiosity Series). The first, the little sister, is pure strawberry cotton candy. And I really do mean strawberry, strawberry in terms so explicit and so unmistakable, that even though it’s in Italian, trust me, for this one, you do not need sub-titles. You get it, the cute little twelve year old, hanging with her older sister and friends, who wears a first perfume to go along with her braces, the ones with the hot pink brackets. Fraaagola’s something to wear while watching the Katy Perry movie and giggling. Fraaagola is a perfectly pink scent spun into sugar by the boardwalk atmosphere, sublimely summery and nostalgic for the rest of us. The perfume’s only real problem is the price, currently on the high side. Has no one told the folks at Luckyscent that the Euro is only just above the $1.20 mark these days? Slightly more mature is Briar Rose, the older sister, but only slightly. This rose is simply a light weight, slightly boozed up gal, out for an evening’s fun with her girlfriends, with a Hershey’s bar in the back pocket of her Daisy Dukes which she will undoubtedly sit on before the evening is out, much to the eew-gross-outed-ness of her friends. You smell it all: the beach roses, the booze, one of those sweet rose liqueurs, the ocean air, a bit of plastic, and the chocolate she has just gotten all over her jeans, and the last of the sea salt drying on her skin. She’s the artless Jersey Goddess out for a good time. At the end of the evening her boyfriend will arrive to give her a ride home- what the hey, little sis, too, in his red Mustang convertible, really his dad’s and he’s not supposed to be driving it, but hey, you can only die once - amirite? He’s got to live it up at the sub shop, and she has to live it down at the pizza place where she’s waitressing. Does it get any better? And hey, baby, how did all this chocolate get on the upholstery? If you grew up in New Jersey, and your family liked going “down the Shore*”, there was probably one seaside town you traditionally visited every year. Maybe there was a house your family had owned for generations, or maybe you visited by the week or the day, in Seaside Heights, or Cape May, Wildwood or Spring Lake, Belmar or Avon-by-the-Sea. For my family, it was Ocean Grove, founded in 1869 by the Methodist church and originally used for camp meetings. (A small section of the “tent city” still exists). We loved the family atmosphere, the peaceful beach, the quaint Victorian homes. 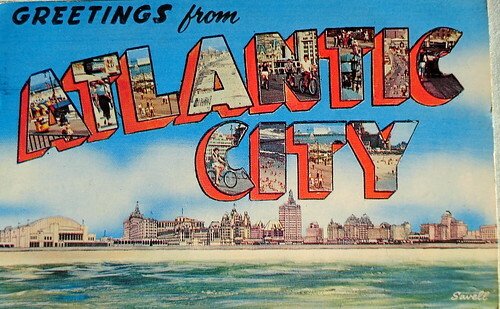 When we wanted the excitement of the amusement park rides and the concessions, we went right next door to Asbury Park. In my parents’ youth, they visited the beaches at both Keansburg and Ocean Grove. I have some sepia-toned photographs of my mother and father, aunt and uncle cavorting and striking poses next to Ocean Grove’s long-gone public pool. They were in their early 20s, and there was no sign that the shadow of the Second World War had touched them yet, although it was just around the corner, and would send both my father and uncle to the Pacific theater. Following my mother’s death in 2008, I’ve sent donations to the Ocean Grove Camp Meeting Association in order to have the cross on top of the Great Auditorium lighted for a week each year in her memory. Ocean Grove was special to us, and I think she would have appreciated it. Now my husband and I have our own tradition of taking day trips to the Jersey Shore during the summer. We have breakfast and dinner in Ocean Grove, spending the day in between on the sand in Bradley Beach. We stroll through the Grove later on, taking in the Victorian architecture which has never grown old for us. We also enjoy visiting Asbury Park, happy for its regeneration and renewal. As you can tell, Ocean Grove represents years of memories for me, of old days, of youth, of fun, relaxation, and happiness. It also brings poignant thoughts of those I have lost. If I were to create a fragrance to evoke what Ocean Grove means to me, what notes would I include? Its floral heart would be the smell of the beach roses growing wild on the dunes. Fruity-floral in the best sense of the term, it's like smelling a rose and a ripe Jersey peach side-by-side. Coincidentally, I think that my favorite white peaches taste a bit like roses! So I'll also add white peach to my formula. Ocean Grove residents are proud of their gardens, and seem to outdo each other every year with a riot of colorful flowers and vines. Dipping my nose recently into a huge yellow lily, I came up with a big streak of golden pollen across my face, in ecstasy from the rich, spicy smell. So Lily will be an addition to my heart mixture. Those of a certain age (like me) will remember the North End Hotel, a huge white clapboard building that flanked both sides of the Ocean Grove boardwalk, with a bridge connecting the two halves overhead. Behind the hotel were rows of small changing booths, made of weathered, salt-impregnated wood, where you could put on your bathing suit and lock up your belongings. An underground passageway led you below the boardwalk and directly onto the beach. My fragrance will have wood in the base, the Atlantic white cedar which was used in some of the original Jersey boardwalks, along with some salt for the sea and air. And speaking of the boardwalk, nothing conjures up the Shore for me like the smell of creosote, which was used as a wood preservative. I’ll take some inspiration from Shalimar and add a tarry note to my fragrance. In the base of the North End hotel was a large restaurant called the Homestead. I was enamored with their sherbet sundaes, made up of scoops of orange sherbet topped with fresh fruits, of which my favorite was the blueberries. I also have fond memories of breakfast with my mom at the Homestead, eating blueberry pancakes and watching the sandpipers on the beach below running away from the surf. Orange and just a touch of blueberry will be my top notes. An optional addition, for those with a sweet tooth, would be the sweet smell of the salt-water taffy that met your nose as you entered the long-gone Criterion Candies store on the Asbury Park boardwalk. So there is my scent memory of the Shore: top notes of orange and blueberry, middle notes of beach rose, lily, and white peach, and basenotes of Atlantic white cedar, salt, and incense to represent the tar note. Taffy optional! What do you think? *In New Jersey “the Shore” is an entity that deserves a capital letter. Of course the first thing that happened on our street, as on hundreds of other streets in the tri-state area, was that the lights went out. We were sitting in the dark, and of course we got out the candles and the flashlight and we had the short wave radio, and for those first forty eight hours I stuck with my strategy of wearing Guerlains for disasters. Specifically I wore Mouchoir de Monsieur, and it worked beautifully. However, two days after Sandy had passed by, when it became clear that no one was going to get their lights back on any time soon, the strategy needed updating. What was required in all the cold, and the dark, and the endless rounds of dishwashing, and Bananagrams, was something comforting. I tried wearing Plus Que Jamais, really and truly, but that perfume seemed to think that she was on her way to the Met and supper in some super sleek venue, and couldn’t understand why we were standing in front of the sink again on our cold feet washing up yet more dishes. This was no place for a Jean Paul Guerlain feminine, she didn’t do fiascos, and so I sequestered her in her plush Guerlain box, and substituted Divine Folie, an old Jean Patou leather, equally unequal to the task of keeping my chin up. That perfume thought it was off to lunch at the Vassar Club, and instead here we were listening to Chris Christie nearly weeping over the Jersey Shore, much of which had washed out into the Atlantic ocean, and picking a fight with the Mayor of Atlantic City, who had told people they could stay, which was just WRONG! Divine Folie was already adjusting her furs, and flouncing off my wrist, back to her fictionalized version of 1930s New York, a place bounded by Elizabeth Arden’s Red Door Spa and the Carlyle, like something out of The Group. The right choice turned up on my doorstep on the first day that mail was resumed Wednesday (I think) and consisted of a bottle of old formula L’Origan that I’d won on Ebay. Meg from Parfümieren had gotten me addicted to that (the first vial is always free) and so I broke down and bought a bottle and it was perfect. It was warm on those cold days and had a sort of golden lightness to it that was very welcome. We were trudging back and forth into the only town nearby with power (Maplewood as it happened) in order to charge phones, and read at the bookstore -- simply called Words and excellent for hearing authors come and speak about their books -- and buy groceries. L’Origan went along with all of that in perfectly graceful understated way. It always made me feel better, and isn’t that exactly what a comfort perfume should do? I noticed later what no doubt anyone reading this noticed at once, old perfumes worked best here. Maybe if I’d grown up with Light Blue, or Angel my take would have been different, but then I didn’t use the vintage perfumes I grew up with, no Arpege, and definitely no Tabu, as it was, it was L’Origan all the way, until the lights came back on when it was a positive blaze of Caron’s Poivre (in extract but of course). Keep Calm And Caron On.